Fans of The Cat Who... mystery series have something to celebrate. 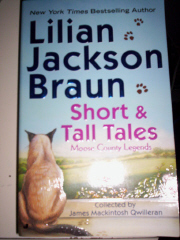 The protagonist of the novels, James Mackintosh Quilleran, has finally finished his work SHORT AND TALL TALES, a series of stories told to him by the residents of Moose county. At the beginning of each tale, Quill explains how each story came into his possession and who gave it to him. Every reader will have a favorite or two but all the unique anecdotes in this book make a delightful holiday gift especially for series fans. Two of this reviewer's favorites are the "Secret Of The Blacksmith's Wife" (revealed to her grandson on her deathbed) and the "Tale Of Two Tombstones" (related by the stonecutter told to his grandson). There are twenty-seven stories in this collection and anytime the reader feels blue, try this collection for a pick-me-up.